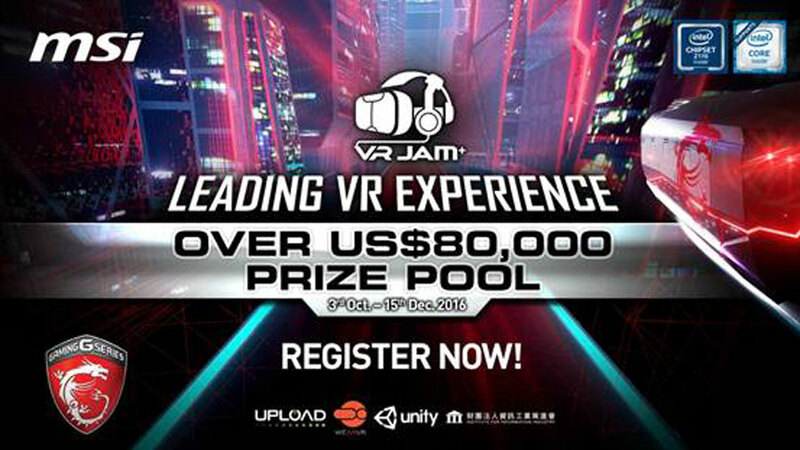 MSI VR JAM, the biggest VR JAM for global VR Game developers this year, with over US$80,000 prize pool which presented by MSI, a pioneer of Gaming industry, providing leading VR experience with excellent compatibility of VR-Ready products for the growing VR industry. MSI VR-Ready products are born for the new era of gaming in virtual reality world. By offering incentives to encourage VR game developers to create impressive VR games which are optimized by MSI VR-Ready products, MSI is achieving another milestone in gaming. In partnership with technology leader Intel, mainstream game engine Unity, famous VR media UploadVR, appealing VR platform WEARVR, and fully support by Institute for Information Industry, MSI host this groundbreaking VR JAM with unflinching devotion to VR community. MSI believes that we can see more energetic potential developers and impressive VR games through this VR game contest. MSI are honored to have a panel of judges, who influence VR industry meaningfully, come from Futuretown CEO Johan Yang, Unity Evangelist Kelvin Lo, WEARVR COO Andrew Douthwaite and MSI Marketing Director Sam Chern. Step 1: Registration & Pitch Submission: No later than 23:59 (UTC+8) 31st October, 2016. Step 2: Screenshot Submission: No later than 23:59 (UTC+8) 20th November, 2016. Step 3: Trailer Video: No later than 23:59 (UTC+8) 10th December, 2016. Step 4: Final Submission: No later than 23:59 (UTC+8) 15th December, 2016.